In a new age of digital music, YouTube videos are replacing live shows just as digital downloads are replacing records. 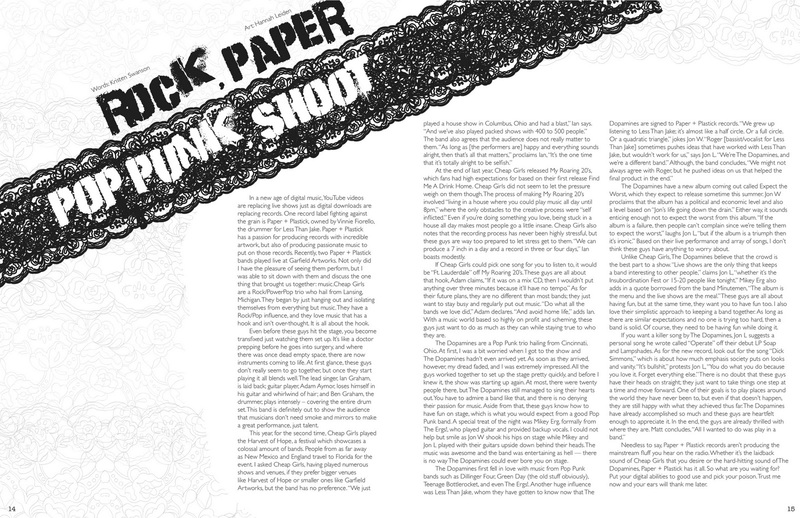 One record label fighting against the grain is Paper + Plastick, owned by Vinnie Fiorello, the drummer for Less Than Jake. Paper + Plastick has a passion for producing records with incredible artwork, but also of producing passionate music to put on those records. Recently, two Paper + Plastick bands played live at Garfield Artworks. Not only did I have the pleasure of seeing them perform, but I was able to sit down with them and discuss the one thing that brought us together: music. Cheap Girls are a rock/power pop trio who hail from Lansing, Mich. They began by just hanging out and isolating themselves from everything but music. They have a rock/pop influence, and they love music that has a hook and isn’t over-thought. It is all about the hook. Even before these guys hit the stage, you become transfixed just watching them set up. It’s like a surgeon prepping before he goes into surgery, and where there was once dead empty space, there are now instruments coming to life. At first glance, these guys don’t really seem to go together, but once they start playing it all blends well. The lead singer, Ian Graham, is laid back; guitar player, Adam Aymor, loses himself in his guitar and whirlwind of hair; and Ben Graham, the drummer, plays intensely covering the entire drum set. This band is definitely out to show the audience that musicians don’t need smoke and mirrors to make a great performance, just talent. This year, for the second time, Cheap Girls played the Harvest of Hope, a festival which showcases a colossal amount of bands. People from as far away as New Mexico and England travel to Florida for the event. I asked Cheap Girls, having played numerous shows and venues, if they prefer bigger venues like Harvest of Hope or smaller ones like Garfield Artworks, but the band has no preference. “We just played a house show in Columbus, Ohio and had a blast," Ian says. "And we’ve also played packed shows with 400 to 500 people.” The band also agrees that the audience does not really matter to them. “As long as [the performers are] happy and everything sounds alright, then that’s all that matters,” proclaims Ian, “It’s the one time that it’s totally alright to be selfish." At the end of last year, Cheap Girls released My Roaring 20’s, which fans had high expectations for based on their first release Find Me A Drink Home. Cheap Girls did not seem to let the pressure weight on them though. The process of making My Roaring 20’s involved “living in a house where you could play music all day until 8pm” where the only obstacles to the creative process were “self inflicted." Even if you’re doing something you love, being stuck in a house all day makes most people go a little insane. Cheap Girls also notes that the recording process has never been highly stressful, but these guys are way too prepared to let stress get to them. “We can produce a 7 inch in a day and a record in three or four days,” Ian boasts modestly. If Cheap Girls could pick one song for you to listen to, it would be “Ft. Lauderdale” off My Roaring 20’s. These guys are all about that hook, Adam claims, “If it was on a mix CD, then I wouldn’t put anything over three minutes because it’ll have no tempo." As for their future plans, they are no different than most bands; they just want to stay busy and regularly put out music. “Do what all the bands we love did,” Adam declares. “And avoid home life,” adds Ian. With a music world based so highly on profit and scheming, these guys just want to do as much as they can while staying true to who they are. The Dopamines are a pop punk trio hailing from Cincinnati, Ohio. At first, I was a bit worried when I got to the show and The Dopamines hadn’t even arrived yet. As soon as they arrived, however, my dread faded, and I was actually extremely impressed. All the guys worked together to set up the stage pretty quickly, and before I knew it, the show was starting up again. At most, there were twenty people there, but The Dopamines still managed to sing their hearts out. You have to admire a band like that, and there is no denying their passion for music. Aside from that, these guys know how to have fun on stage, which is what you would expect from a good pop punk band. A special treat of the night was Mikey Erg, formally from The Ergs!, who played guitar and provided backup vocals. I could not help but smile as Jon W shook his hips on stage while Mikey and Jon L played with their guitars upside down behind their heads. The music was awesome and the band was entertaining as hell — there is no way The Dopamines could ever bore you on stage. The Dopamines first fell in love with music from pop punk bands such as Dillinger Four, Green Day (the old stuff obviously), Teenage Bottlerocket, and even The Ergs!. Another huge influence was Less Than Jake, whom they have gotten to know now that The Dopamines are signed to Paper + Plastick records. “We grew up listening to Less Than Jake; it’s almost like a half circle. Or a full circle. Or a quadratic triangle,” jokes Jon W. “Roger (bassist/vocalist for Less Than Jake) sometimes pushes ideas that have worked with Less Than Jake, but wouldn’t work for us," says Jon L. “We’re The Dopamines, and we’re a different band." Although, the band concludes, “We might not always agree with Roger, but he pushed ideas on us that helped the final product in the end." The Dopamines have a new album coming out called Expect the Worst, which is expected to release sometime this summer. Jon W proclaims that the album has a political and economic level and also a level based on “Jon’s life going down the drain." Either way, it sounds enticing enough not to expect the worst from this album. “If the album is a failure, then people can’t complain since we’re telling them to expect the worst,” laughs Jon L, “but if the album is a triumph then it’s ironic.” Based on their live performance and array of songs, I don’t think these guys have anything to worry about. Unlike Cheap Girls, The Dopamines believe that the crowd is the best part to a show. “Live shows are the only thing that keeps a band interesting to other people,” claims Jon L, “whether it’s the Insubordination Fest or 15-20 people like tonight.” Mikey Erg also adds in a quote borrowed from the band Minutemen, “The album is the menu and the live shows are the meal." These guys are all about having fun, but at the same time, they want you to have fun too. I also love their simplistic approach to keeping a band together. As long as there are similar expectations and no one is trying too hard, then a band is solid. Of course, they need to be having fun while doing it. Needless to say, Paper + Plastick records aren’t producing the mainstream fluff you hear on the radio. Whether it’s the laidback sound of Cheap Girls that you desire or the hard-hitting sound of The Dopamines, Paper + Plastick has it all. So what are you waiting for? Put your digital abilities to good use and pick your poison. Trust me now and your ears will thank me later.